Hi all and thanks in advance for helping out. It's so great to have a forum like this, a trouble shared is a trouble halved and all that. Anyways, I have a kart (http://imgur.com/KhEdGVf) that rolls on four casters and I want to investigate how the legs of this kart will splay outward when it carries a load. The casters are connected to metal plates welded onto the bottom of the kart's frame; I call these "caster pads". - Constrain all three translations of a single point at the centre of one caster pad, while allowing rotations. - Constrain a point on each of the remaining caster pads to translation along a horizontal plane, again allowing rotations. I can acheive a something close to this by fixing one caster pad surface ( ie. all translations and rotations) and allowing the other caster pad surfaces to roller/slide horizontally. However, I don't this it's realistic to constrain the caster pad surfaces against rotation from horizontal. A workaround I've used is to shrink the size of the constrained surfaces so that they approximate points, but this obviously causes a high stress spike around those constraints. 1: I don't seem to be able to constrain a point on the solid mesh while restraining translations only; the constraint symbol that results when constraining a point indicates rotations are prevented for that point. Now, a point can't really rotate, can it? Is fixing translation of a point while allowing rotations of the geometry around that point possible? 2: The advanced restraints options only allow me to constrain a point on a plane and have it move in either a positive or negative direction in x or z, not both. Any idea why this is? I ask because I'm not certain which direction my caster plates might play out along although I can guess. 3: Adding the constraints the way I've described using the advanced restraints menu (and ignoring the issues raised by 1 and 2) just causes my solver to fail and make me sad. Any general thoughts or comments that may help? Perhaps having all the vertical load supported by points only isn't workable as the weight is supported by zero area? I suggest restraining the top of your kart (I would call it a gantry) relative to a plane (because the loading is symmetrical some features will not rotate) and not restraining the feet. Interesting, I had briefly considered this. So I am considering model the ground reaction force on the caster pads and adding fixtures where the load is applied. >solid elements only have translational degrees of freedom. >using a restraint you are setting the displacmeent. ie fixed = setting displacement to 0. choosing negative or positive isn't allowing motion in one direction or another, it is a displacement that is prescribed. what exactly did you apply? to me, everything looks quarter symmetric, that will basically 100% resolve your problem. i'm not sure i totally understand converting the connection between the caster and the pad with a point. it seems like some kind of contact that allows separation and interaction is the best way. someone recently posted an example of a chair that is very similar to yours. take a look for it, the technique should work for you. Is there a particuar reason why solid elements only have translationsal degrees of freedom or is this a limitation of the software? 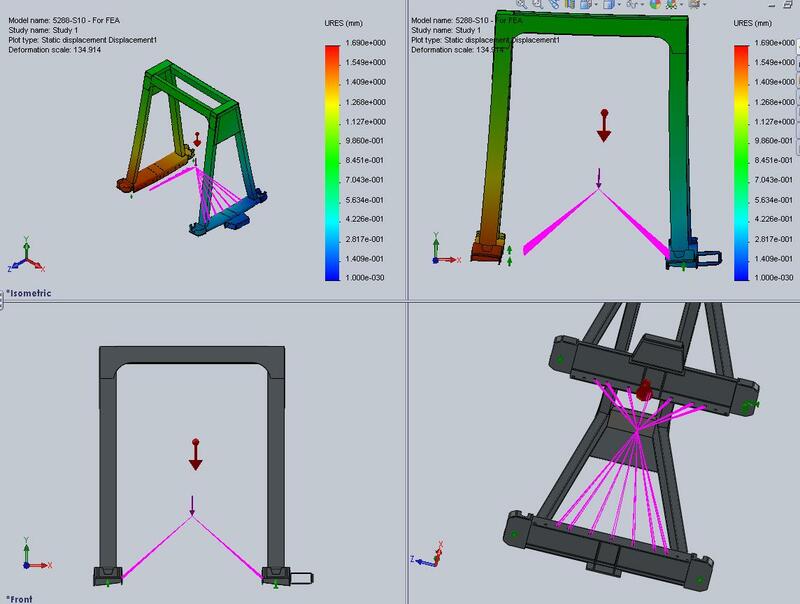 For example, can FEA specific programs such as NASTRAN limit solid elements' translation while allowing rotation? Here's a screen shot of the restraint I applied. I was under the impression that the dialog box below was confining a point onto a plane. However you seem to be telling me that this in fact forces the point to be displaced by the distance entered, correct? Is there anyway to limit a point to move within a plane? I am interetsted in "converting the connection between the caster and the pad with a point" in order to allow the caster pads to rotate while splaying outward. solid element DOF, here's a couple articles that discuss it. they aren't in depth but should get the point across. your boundary condition was telling the software to move the vertex 1m in the 2 planar directions and but stay on the plane. if you had left the 2 planar directions empty, it would have been a normal restraint and it would have stayed in the plane. but unlike "real life" it can't lift off the plane. as long as your load is completely downwards, it should be ok. the only way to get a true version of what you want would be to model a cone and put the cone end on a surface with contact. Awesome Jared, thanks for this and all the other useful comments I've seen you post on other threads.